STATEN ISLAND, N.Y. — Livery drivers see snippets of human drama unfolding over and over as they navigate their cars through Staten Island’s streets. Especially late at night, if something unusual is taking place on the side of the road, a cabbie’s first impulse might be to drive on. The Delta Car driver made a split-second decision to stop, in the wee hours of Sunday morning, when he spotted a large man, bleeding profusely from his head, trying to flag down passing cars from the corner of Ann Street and Port Richmond Avenue. That choice may have saved somebody’s life. Matta, 21, said he knew he had to get the man to the emergency room, fast, and he drove toward Richmond University Medical Center. “He wasn’t drunk; he was just badly beaten. It wasn’t a little fistfight; it was really bad, his fingers were splitting in half, he had cuts everywhere. He said he couldn’t bear the pain,” recalled the Staten Island native, who moved a few years ago to New Jersey. Matta dropped his wounded charge at the West Brighton hospital, opening the door so he could stagger toward intake. According to a law enforcement source, the 39-year-old St. George victim had been attacked by three men as he was returning home from a party — he was beaten bloody and robbed of everything in his wallet and pockets. After Matta dropped him off, the man was treated at the hospital and subsequently discharged. No arrests have been made in the case. “The detectives told me the guy could have died if I didn’t take him,” said Matta, without even a hint of pride in his voice. “Ricky is a nice guy, that’s his personality. 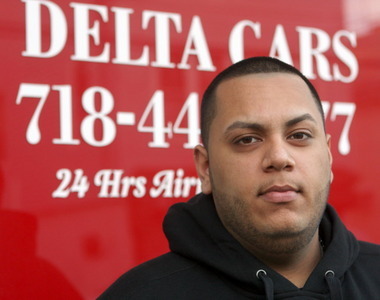 We call him the Delta hero,” said dispatcher Eric Hatter, who was on call when Matta walked in and asked for more napkins to clean the back seat of his car. “He told me about what happened. I thought maybe the guy got in a fight because Saturday night gets crazy. Then I saw all the blood in the car. I hope they catch the people that did it. But being a hero was not what motivated Matta to stop when others drove on — it was our common humanity. “If it was one of my friends, if it was me, I would want somebody to stop. I know what it’s like to lose someone,” said Matta. Just months ago, he continued in a quiet voice, his older brother took his own life. And so he couldn’t simply pass by somebody who seemed so alone and so vulnerable.